for every chiropractor’s diagnostic imaging needs! Safety, Comfort, Simplicity and Performance – Control-X Medical provides the top level of quality, durability and value in Hospital Grade chiropractic systems. 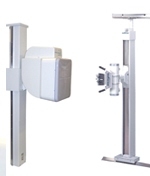 radiographic systems offer affordable solutions to eet the diagnostic imaging needs of very chiropactic office. These systems are designed to meet the high performance demands of most settings by employing the latest technology in our generators and using versatile components. The tubestand travels effortlessly along the floor track. 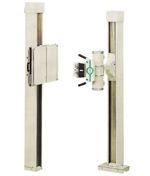 The counterbalanced tube arm support system ensures smooth and easy vertical positioning. The tubestand also has easily accessible fingertip controls for all movements ensuring troublefree use by the operator. 17" or 36" bucky or grid cabinet. Electromagnetic lock system Electromagnetic brakes provide reliable and precise positioning for both the wallstand and the tubestand. Easy-read tube settings X-ray tube position settings are in cms/inches and degrees. Optional digital angle position display for easy readibility. Dual rope counterbalancing system.It ensures maximum stability and security with minimum effort of movement for both the tubestand and wallstand. Excellent maneuverability Both the tubestand and wallstand are designed with “easy-glide” effortless movement for vertical and horizontal (tubestand only) travels. Exceptional versatility The extended vertical movement of the tube and the wallstand supports examinations on patients with various anatomical characteristics. Low dosage exposures. The high frequency techniques of the ConRad generator assure accurate exposure parameters. Vertical force required: 20 N (4.4 lbs) max. Longitudinal force required: 40 N (8.8 lbs) max. Normal operation is with grid cabinet, bucky option is available. We offer a large variety of x-ray tubes to match the generator output and system requirements. Certified collimator with manual shutter controls; hand guided illuminated field size indicators; including swivel mount. Laser guided and automatic collimators are available. 20-80kW, 125-150 kV. Single and three phase input power. Anatomical programs (APR) and Automatic Exposure Control options (AEC) are available.